Imagine the scene: a group of Chinese peasants digging a well in the parched earth of northwest China stumble upon, not water, but one of the greatest archaeological finds of modern times. As the laborers dug, they unearthed pieces of a clay figure, which turned out to be not just a single clay figure, but rather, an entire clay army. They had found the tomb of Qin Shi Huangdi, China’s first emperor –– a tomb complete with an army of clay soldiers, each with their own unique facial expressions and each positioned according to rank. So why the army? In order to achieve immortality, the emperor had an underground city built that was guarded by what else but life-sized terra cotta warriors, infantrymen, horses, chariots, and more. 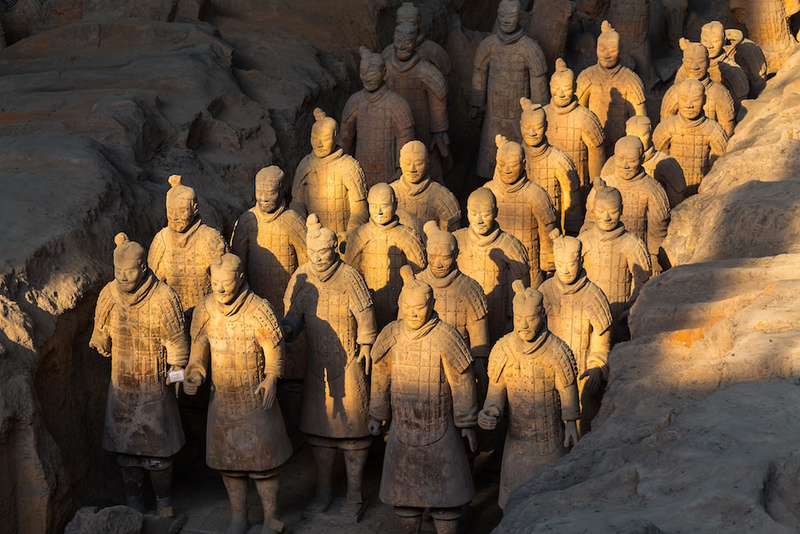 The date of the discovery was March 1974, more than 2,000 years after the emperor was buried with what is now famously known as his Terra Cotta Army. The excavation on the site, beneath an ordinary Chinese persimmon orchard, continues to this day. So far, only a portion of the estimated 8,000 warriors have been unearthed, leaving this fascinating archaeological find ongoing.